The Atlanta Braves are loaded with young players who will look to bring the Braves their first title since 1995. With the rise of the Washington Nationals and Miami Marlins, the NL East has turned into one of baseball’s tightest pennant races. Atlanta will look to revamp their winning ways and jump right back into championship consideration. 2018 Atlanta Braves tickets puts you right in the middle of one of the most passionate fan bases in the league conducting their intimidating tomahawk chops in the direction of the opposition game in and game out. To see their games live get your Atlanta Braves tickets here! The few years have been rough for the Atlanta Braves. The team that has three World Series Championships has seen itself struggling ever since it was defeated by the Los Angeles Dodgers in the NLDS in 2013. They haven’t appeared in the postseason since. In the 2017 campaign, The Braves finished third in the East Division. 2017 was also the first season for the Braves at SunTrust Park, after playing at Turner Field for the past 20 years. A team like the Atlanta Braves has no shortage of unforgettable moments. Let’s take a look at some of them. The 1995 Season – After coming up short against the Minnesota Twins and the Toronto Blue Jays in 1991 and 1992 seasons, the Atlanta Braves once again qualified for the playoffs in 1995. This time, they went on to defeat the Cincinnati Reds and the Cincinnati Reds in the NLDS and NLCS respectively before they locked horns with the Cleveland Indians for the World Series title. On October 28, 1995, the Braves beat The Tribe in four out of seven games and won the World Series Championship for the first time in thirty seven years. The Braves Vs The Miracle Mets – In the 1999 season, the Atlanta Braves collided with the New York Mets in the NLCS. Everything was going the Braves way as they won the first three games of the series. Turning point came when the Mets bounced back and won two games consecutively which led to Game six. It was a do or die situation for the Braves but in the end, they emerged victorious and went on to face the New York Yankees for the World Series title. The Atlanta Braves have heated rivalries with the New York Mets and the Washington Nationals. Braves-Mets Rivalry – This rivalry between the Atlanta Braves and the New York Mets is fierce. They met for the first time on May 11, 1962, at the Polo Grounds with the Braves winning 8-5. The root cause of this rivalry was the Division alignment that saw the Braves ordered by the MLB Commissioner, Fay Vincent to move to the NL East. In 1999, this rivalry escalated when the two teams collided with each other in the NLCS which was won by The Braves, 4-2. Braves-Nationals Rivalry – The Braves and the Nats had all the makings of a great MLB rivalry. These two teams became rivals when the Braves became a member of the NL East in 1994. The Nationals had already been there since their establishment in 1969. Since then, the two teams have played each other in many grueling games. The Braves and the Mets squared off in one of the longest games played between them which lasted for 5 hours and 29 minutes. It was held at the Turner Field on August 17, 2013, where the Nats came out victorious 8-7. Before the Atlanta Braves moved to their new ballpark, SunTrust Park, they used to play their home games at the Turner Field. They started playing there in 1997. The Braves played their last game at the venue on October 2, 2016, against the Detroit Tigers which they won, 1-0. Built in 1996 for the Atlanta Olympics, Turner Field appeals to fans of all ages. The Coca-Cola Sky Field contains a base path which kids can run during the games, as well as an unobstructed view of the downtown Atlanta skyline. Scouts Alley features interactive baseball-themed games and restaurants, as the Chop House, allow fans to enjoy a delicious meal while watching the game from the outfield. Hank Aaron played for the Atlanta Braves from 1954 to 1974. During his time with the team, he appeared in a whopping twenty four MLB All-Star games. Moreover, he won three consecutive Golden Glove Awards in 1958, 1959 and 1960. Hank also became a two-time NL batting champion and a four-time NL home run leader. Eddie Matthews is another star player who remained with The Braves from 1952 to 1966. While Mathews was with the team, he made it to multiple All-Star games and also became a two-time home run leader in 1953 and 1959. Atlanta Braves retired his number 41 on July 26, 1969. Then there is, Greg Maddux who began playing for the Braves in 1993. He remained on the roster till 2003. He too played an instrumental role in the team’s success and won the NL Cy Young Award four times. Maddux also became a four-time MLB Era Leader. Other than these players, Bobby Cox, Joe Torre, Gaylord Perry and Phil Niekro also played for the Braves. All these stars have been inducted into the Atlanta Braves Hall of Fame. After they failed to make it to the playoffs in the last three campaigns, the Atlanta Braves are looking to make their presence felt in the 2017 season. The Braves fans are curious to know if their favorite team will make it past the regular season. To find out, all you need is your Atlanta Braves 2018 tickets. Get them now before they run out. Our process for purchasing cheap Atlanta Braves tickets is simple and fast. There are so many online ticketing sites, that it can be hard for customers to find the right place to buy Atlanta Braves tickets at the cheapest price. At ScoreBig we think of our customers first and foremost. We offer daily deals for Atlanta Braves events, so our customers can get the best seats for the best prices. ScoreBig will always go above and beyond to offer the cheapest Atlanta Braves tickets on the market. The Atlanta Braves schedule above, displays all available events for 2019 and 2020. Once you find the event that you would like to go to, click the red “Get Tickets” button. It is located on the right-hand side of the event listing, it will take you to an Atlanta Braves event ticket page. ScoreBig's event ticket page will display all available Atlanta Braves tickets for that event. On the event ticket page to help with your search for the right Atlanta Braves tickets, use the filters at the top to select quantity, price range, and more. There is also an interactive seating chart so you can pick where you want to sit. When you are ready to buy a ticket, click on the listing, and you will be directed to ScoreBig's checkout page. Upon completion of the information fields, your order will be processed and your Atlanta Braves tickets will be delivered via email, mail, or to your mobile device. What makes ScoreBig’s site stand out from the rest? We are constantly analyzing our competitors to improve our site, service, and prices. ScoreBig.com employees strive to offer the best process and experience to buy cheap Atlanta Braves tickets. Our goal is to get you the best seats to Atlanta Braves events. We offer daily discounts on our site and for special promotions check out our newsletter. If there are no Atlanta Braves events currently available, you can use our search feature at the top of the page to see a list of all popular events going on near you. No matter your price point, we have all the best deals and discounts on Atlanta Braves tickets. For more information on prices of Atlanta Braves tickets and the schedule for Atlanta Braves, check out our listings above. The last thing you want to find out is when the Atlanta Braves event you wanted to go to is sold-out. Don’t worry in many cases ScoreBig has affordable tickets to sold out events. We sell tickets from GA all the way to premium seating and parking. Skip the scalpers in the parking lot and get your tickets online from top Atlanta Braves ticket brokers. We get you in all events, buy your Atlanta Braves tickets here from a brand that many trust and rely on for all their ticketing needs. ScoreBig offers a 100% money-back guarantee. If you have been in search of cheap tickets for Atlanta Braves, ScoreBig by far is the best option. That’s why ScoreBig has more loyal customers than any other ticketing site. 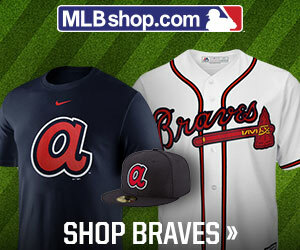 Shop at ScoreBig for safe and secure Atlanta Braves event tickets.